Summer availability at great rates! Beautiful condo in great location. The Kamaole Beach Royale condominium #409 is conveniently located one block from beautiful Kamaole Beach I. This half-mile long beach is perfect for walking, swimming, sunbathing and building sandcastles with your keiki (children). The condo is within easy walking distance from a wide range of shopping and restaurants ranging from local fast food, ice cream, fabulous seafood, and many ethnic restaurants. There is a health food grocery store and rental shops for snorkeling and beach equipment within a block of the condo. Once you arrive, you can settle in to a relaxing vacation with all your needs met within a short distance. 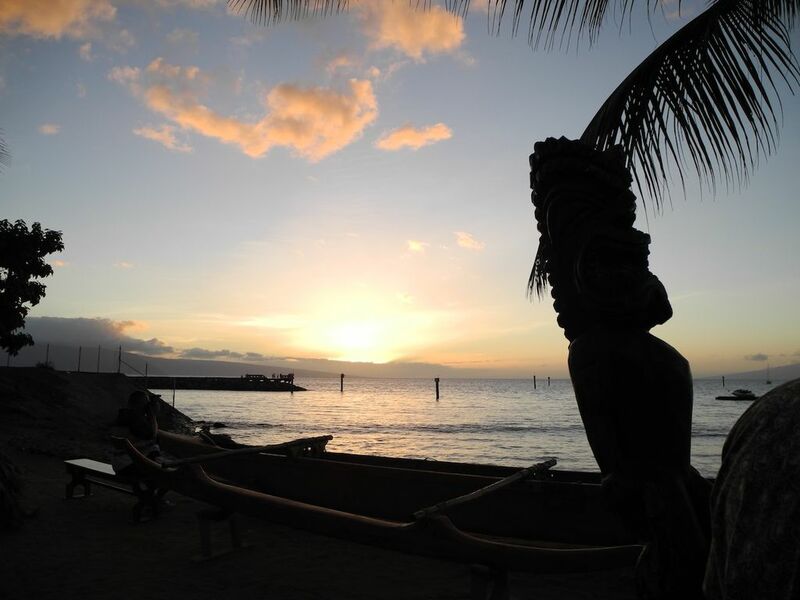 If you have an adventurous spirit, our condo will provide you an excellent base for exploring the many sights of Maui. Our condo is located on the 4th floor with an excellent view of the ocean and sunset. The condo features a new HDTV and wifi wireless internet. The kitchen and bathroom cabinets were completely remodeled in 2017. The unit is fully equipped, including beach chairs and mats plus beach toys. During humpback whale season, you can watch the whales breaching while you eat breakfast on the lanai. The afternoon tradewinds provide a cool breeze to finish the day. The rooftop barbecue area provides a fabulous view of the sunset while you prepare your dinner and dine al fresco. Please be our guest in beautiful Kihei, Maui at Kamaole Beach Royale #409. We live in the Denver area and enjoy the great Colorado climate for camping in the summer and skiing in the winter. Ed is a veterinarian who specializes in dentistry on small animals - mostly dogs and cats and sometimes rabbits, ferrets, and other small household pets. He volunteers his time to help exotic animals, such as lions and tigers, with dental needs. Coralee is an Enrolled Agent and works as a tax preparer during tax season. She volunteers as a docent at the Denver Zoo. Our daughter is now grown and works in the mental health field. We love the Kihei area because it is less congested, and more relaxed and family-friendly than other areas of Maui. The condo is conveniently located near shopping, restaurants, and a great family beach. We love to scuba dive and the condo is one mile from the Kihei Boat Ramp where many of the Maui dive boats depart from. We've been vacationing in Maui since the late 1970's and found that is the perfect home away from home for us. We love walking on the beach in the morning and picking up the local newspaper and coffee drink at one of the nearby espresso stands. The trade winds blow the heat away in the afternoon, making the evening sunset a perfect time of day. Sunset finds us enjoying cocktails either on the beach or on the rooftop and cooking dinner on the barbeque. After a day of sea and sun or sightseeing on Maui, it's an ideal way to end the day. Kamaole Beach Royale is one block from Kamaole Beach I.
Haleakala is the eastern view. Guests can view the sunrise over the volcano from the condo. Located on the 4th floor, there is an unobstructed view of the ocean from the lanai. During winter, whales can be seen from the condo's lanai. New A/C unit installed 2018. Also a coffee grinder for guests who prefer fresh ground coffee. New range, microwave and dishwasher in June 2015. Kitchen remodeled in 2017.. Dining inside and outside plus rooftop barbecue and tables. Kamaole Beach Royale pool was updated and resurfaced in September 2017. Available for the use of the guests at Kamaole Beach Royale. This condo offered everything we needed for a family with a bonus of great location in Kihei. The views from balcony was very beautiful, and we enjoy having the meals about twice a day (rather than going out for a restaurant every time)! The artworks in the walls were very pretty. Thank you for letting us stay in your wonderful condo- It was the best vacation we had as a family! It was just as advertised. Close to nice beach, nice view. 7th floor has nice patio with best view of sunsets. Kamaole Beach Royale Resort was a great place to stay ! The condo had everything you would need to enjoy Kihei. The bed was incredibly comfortable. The layout of the condo was perfect, Being ocean view we had a perfect view of the “Maui Sunset” every night, which is a great way to end your day in the sun. The condos location is second to none, with shopping and restaurants steps away . We recommend the Gelato Shop, which you can see from your balcony, Maui Tacos is great casual food, and no stay in Kihei is complete without a visit to Tommy Bahamas for a great dining experience ! This condo had everything you could want and made our stay memorable! We’ll be back again! Thank you Thomas and Jenn for writing such a wonderful review of our condo. I appreciate that you took time to do this make restaurant suggestions. It is helpful for prospective guests. I so happy you enjoyed your stay and I hope you will return in the future. It's located in a great spot, and the view from the lanai is even better than the VRVO photos. The property is well-built and solid. Noise from other units is practically non-existent (this is something I always worry about). The way the signage emphasizes quiet seems to really work. The lanai is great - the 4th floor is high enough that you get a solid view of the beach and waterfront, and the sunsets were memorable. I got some great superzoom vidoes of whales right from the lanai. Kitchen is great and well supplied, there's an air conditioner if you need it (we didn't), the bedroom ceiling fan is quiet. The bedroom is in the back of the unit, next to the entry door, away from the lanai and view, which actually actually turned out to be the quietest possible spot. I'm an early riser and could therefore hear the noise of trash collection going on at the property just to the west, but my sleeping wife could not. If we return to Kihei we'd be glad to stay here again. Great views, rooftop bbq it a great place for sunsets. Great location. The owners were very accommodating. Would definitely stay again. I had the pleasure of staying here a few weeks ago for 11 days and was more than pleased with this condo. The first thing you notice is the incredible view from the lanai, I spent every morning having my coffee and fruit just enjoying the view. The condo itself was very clean and well stocked. It has any and all your kitchen needs to make any meal as well as a variety of seasonings and sauces. There is a collection of beach chairs, towels, boogie boards and snorkel gear. The mini cooler came in handy as well. The location of this condo cannot be beat. It's within walking distance of some great restaurants, an ABC store just around the corner and a great gelato place across the street (I'm glad I saw this towards the end of my trip, otherwise I would have been there everynight). I had a hard time cooling the bedroom down the first evening, I emailed Coralee and she gave me some get tips to help and the rest of my trip was nice and cool. Overall I I had no complaints and would stay here over and over again!! Thank you, Amee, for your glowing review. I'm so glad you had a wonderful vacation in Maui and enjoyed the condo too. You are more than welcome to stay at the condo any time and I hope you will keep us in your travel plans.